Comics UK - View topic - Comic characters merging..
Calamity James meeting Jonah was a good one in a celebration Beano issue..
also remember Ping the elastic man meeting Minnie..
What others have there been and what would make a good merge..
Puss and Boots and Meebo and Zuky! Ivor Lott and Tony Broke teamed up with female counterparts Milly O'Naire and Penny Less when their comics merged. As you mentioned, Cuddles and Dimples joined forces for the same reason. Bea the Mini-Menace and Ivy the Terrible joined forces for a few months in The Beano, but the 2009 Dennis and Gnasher relaunch curtailed that. Jonah met Puss and Boots in several comic libraries. Big Fat Joe, Swanky Lanky Liz, Doubting Thomas, Polly Wolly Doodle and her dog Pongo, and Contrary Mary the mule, all joined forces with Lord Snooty after having their own strips. Baby-Face Finlayson joining the Bash Street Kids... among others. Help! Help! We're being held prisoner in a signature factory! I think a good benchmark is whether the strip is a crossover (eg Baby Face and Snooty appearing in a Bash Street Kids strip), a joint series (Ivy and Bea) or a full merger (Kid Comic and Smiler, Ivor/Tony and Milly/Penny, Cuddles and Dimples). 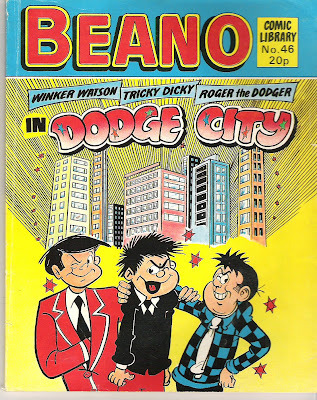 There are any number of crossovers (I very much enjoyed the Roger/Winker/Tricky Dicky comic library! ), but mergers and joint series are interesting to track because they aren't so common. Lord Snooty was the king of mergers, but it's also interesting to look at mergers of non-equals, such as when Young Arfur moved to Buster with the other School Fun characters, and Softy Sir and Creepy Crawler became supporting characters - Softy Sir as his main teacher, and Creepy doing cameos as a victim of put-downs and generally being bettered by Arfur's wits. Am I right in thinking that at one stage the Ivor Lott and Tony Broke strip merged with The Toffs and The Toughs to become Ivor's Toffs and Tony's Toughs? If so, that's 3 strips that Ivor and Tony were involved in (the second being with Milly/Penny as mentioned by Digi). Last edited by Niblet on 23 May 2011, 20:08, edited 1 time in total. 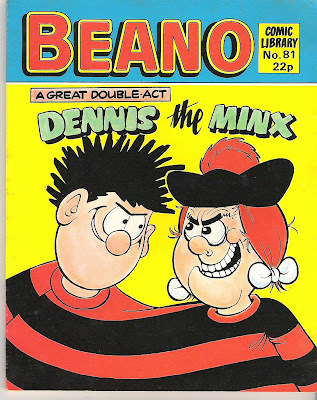 I think comic libraries were the place to get 2 or more strips characters in one, like 'the smasher and walter' 'the smasher and dennis the menace' and 'Ivy, Beryl and Minnie'. loads more, there just the ones that came in my head. You can read my latest ramblings at my brand new BLOG, or you can have a peak at some of my illustrations and comics on my DEVIANTART page! When POW! absorbed WHAM! the Tiddlers and the Dolls of St. Dominics became one strip. Bit like the Ealing comedy "The Happiest Days of Our Lives" when a Boy's school merged with a Girl's. Another obvious one is in roger's 40th birthday issue, when he toured around each strp in the beano, teaming up with each one. Here are some team ups..
heres the one we were talking about..
From what I've seen of #33 (in one of the retro books), Dave Sutherland did a good job aping Jack Prout, and there aren't many artists who could combine those two drastically different styles so effectively. The classic crossovers I remember are from the late 90s/early 2000s and were drawn by Mike Pearse - the full-length story issues. They mainly featured the Bash Street Kids with one or two other Beano characters. Issue #3025 (July 8th 2000) features the Bash Street Kids racing Roger, Dennis and Minnie to find treasure. Others drawn by him include the Christmas issue with the Bash Street Kids putting on a nativity play, and the halloween one where the Bash Street Kids get lost in the woods trying to scare Teacher. 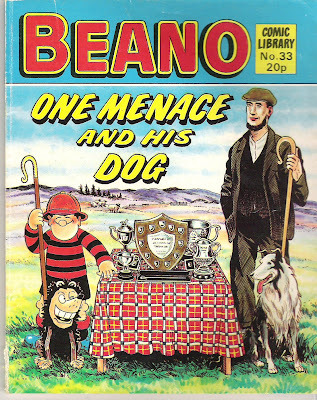 Both of these feature other Beano characters and are all particularly funny - I very much admire Mike Pearse's style and these full-length stories never fail to make me laugh out loud. Comics Library Editor Ian Gray said that this was likely his favourite publication: I think it was the only one completed by master craftsman Dave Sutherland, although that cover is possibly by Steve Bright, who did the bulk of 'em. John Geering done most of his own covers. I think it was the only one completed by master craftsman Dave Sutherland, although that cover is possibly by Steve Bright, who did the bulk of 'em.